RTC: Rural of University of Montana is researching these impacts. They are looking at the accessibility of the participants bathrooms and the entrances to their homes. Surprisingly, 56% live in homes with inaccessible bathrooms and 57% live in homes with a stepped entrance. This is troubling since the need for affordable, accessible housing is only going to increase with an aging American population. 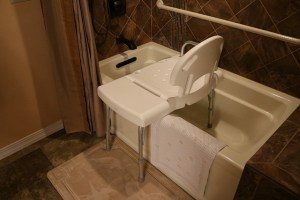 The American Time Use Survey found that people with mobility impairments bathe less often, and when they do they expend more energy doing so. RTC plans j to build on this information by investigating whether expending that much energy on bathing affects their choices to be active at home and in the community. One metaphor to explain this is the cell phone theory, which compares the amount of energy a person has to the battery life of a cell phone. Some cell phones have fully functional batteries, but others have batteries that no longer hold a full charge, which requires the user to make decisions about how to spend that limited battery power. Do they use the phone minimally to save power only for important phone calls, or do they start taking a lot of pictures and posting on the internet, which will use up their battery in a couple hours? Essentially, a person has a limited amount of energy each day, and if they use up a big percentage of that energy on bathing they then have less energy for other things, leaving their battery drained. They will compare strategies of either installing assistive bathroom equipment reducing effort needed to bathe, or provide regular physical exercise increasing a person’s energy level. Then they want to look at what people choose to do with that extra battery life. Will they spend it participating in their communities? Forty five people have participated in one of the two interventions. Over the next two years, the researchers aim to collect 600 surveys and have 160 people participate in the interventions. About 25% of the U.S. population, live in a household with at least one person with a disability. While this includes all impairment types, not just mobility difficulty, this is still a significant portion of the American population. Many of those (40 million) are people without disabilities themselves but live in households with at least one person with a disability. Homes that are more accessible will not only improve the quality of life for the person with the mobility impairment, it can also reduce the amount of caretaking responsibility assumed by other household members. And, if it requires less energy or exertion to perform daily activities, like bathing, will people with disabilities—and their caregivers—have more energy for community participation, such as employment?